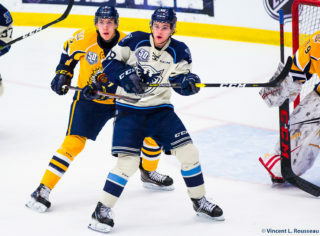 Val d’Or, Que.– Since being linked up a few short weeks ago, the Phoenix’s top line of Samuel Poulin, Patrick Guay and Alex-Olivier Voyer have been lights out. 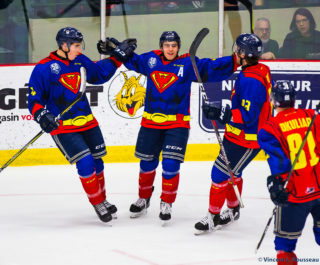 The trio made up of a rookie, a highly touted prospect and a veteran made the most of their ice time again tonight, combining for 8 points in their team’s dominant 4-1 win over the Val d’Or Foreurs. Fresh off earning an honourable mention for his outstanding play in the month of November, Voyer is picking up right where he left off with 5 points in 2 games this month. Meanwhile, after a slow start for his standards, Samuel Poulin has found his stride, notching 19 points in his last 13 games. Patrick Guay, who was injured for the better part of October, got back into the lineup in early November and immediately made an impact. He has followed his new line mates’ lead with 11 points in his last 10 games, 8 of which are goals. The Phoenix got off to a hot start again tonight, as Julien Anctil gave them the lead just 3:17 into the contest. Just under three minutes later, Voyer cleaned up the garbage in front of the net, putting the Birds up 2-0 on the power play. The Foreurs came alive after Voyer’s goal, but Thommy Monette was able to weather the storm, stopping all eight shots he faced in the period. 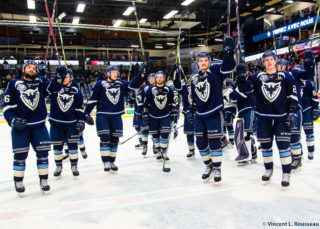 Val d’Or was eager to get back into the game early in the second, recording the first four shots of the period, but Monette remained focus and his team took control from there. The Phoenix replied with the next ten shots of the game, finally beating Mathieu Marquis for a third time. Patrick Guay lead the 3-on-2, before dropping it to a trailing Samuel Poulin in the slot who buried it for his 14th of the season. 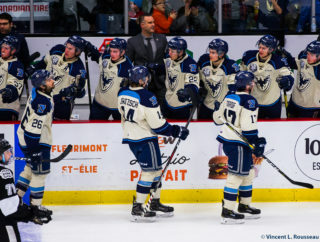 The third period was again controlled by Sherbrooke, with Voyer scoring his second of the game at 13:23 to lock down the victory for the Phoenix. Thommy Monette was 1:33 away from collecting his first career QMJHL shutout, but Émile Lauzon was able to squeeze one by the 17-year-old to make it 4-1. Nonetheless, the Phoenix went on to win, out shooting the Foreurs 43-23 on the road, for their third victory in the Abitibi region this season. The Phoenix are back in action tomorrow night against the first place Rouyn-Noranda Huskies (23-5-0) at 7:00 p.m.